ThrU-Turn Intersections - Pedestrian-Friendly, Place-Making Solutions to Congestion! The "Bowtie" is part of the "ThrU-Turn" family of innovative concepts. 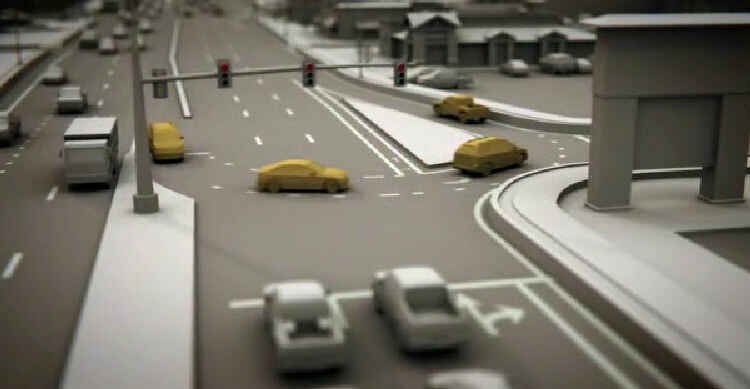 In this sketch of a major arterial, traffic making a U-turn around the ellipse can merge with oncoming traffic, eliminating the need to install a signal that would stop oncoming traffic as necessary with a Loon. The median can be landscaped, or potentially used as a major transit station. All over the nation, planners and residents alike hope to reinvent languishing suburban retail corridors into sustainable, livable, transit and pedestrian-oriented "Places" within the midst of their stale, Anywhere USA sprawl. But the exciting Visions created by well-meaning stakeholders, planners, and architects often bump up against a hard reality: The streets in question often carry huge traffic loads and it is extremely difficult to acquire the space for desired "Complete Streets." And engineers charged with managing the street simply will not accept form over function. In truth, to be truly livable and to sustain desired TOD densities, these intersections need to flow well. 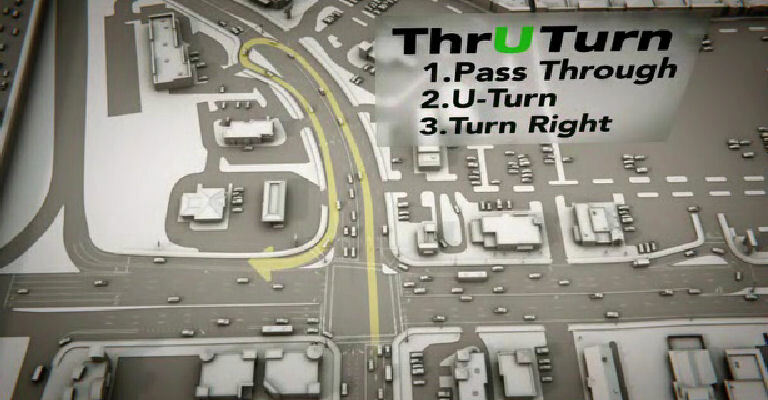 "ThrU-Turns" describe a family of designs such as Median U-turns, Bowties, Loons. These are hot new designs with excellent Place-Making qualities as well as exceptional ability to move a lot of traffic at slower maximum speeds, but higher average speeds, without congestion through sensitive mixed-use, multi-modal areas. Have you ever tried to turn left from a parking lot onto a busy arterial, and found it so impossible to get a gap in both directions that you instead went right, then made a U-turn? Thru-Turn designs such as Median U-turns, Bowties, Loons, Superstreet Intersections, Michigan Lefts, and even Roundabouts successfully formalize this action with amazing results. ThrU-Turn accomplished using a Bowtie concept. Retail-oriented roundabouts on a low-speed, pedestrian-oriented cross-street. In the diagrams, some lefts are completed as "right-U-through." Others are "through-U-right." Either way, the result is that the former left turn pocket is no longer needed, so fill it with a transitway, or whatever Place-Making architects can dream up! And since there are no left-turn arrows, the intersection can handle more traffic with significantly less delay, and it is also much easier for pedestrians to cross. Decades ago, transportation engineers recognized that if you forced traffic to go "through-U-right", it would eliminate the need for left-turn arrows, resulting in far less congestion. Michigan took it to heart. It takes a lot of space for large vehicles to make a U-turn, and Michigan engineers required that hundreds of miles of roadway include extra-wide medians to accommodate these U-turns. But what can you do if past planners and engineers didn't bless you with wide medians? A "Loon" is a great variation that simply carves out a small piece of a convenient parking lot to create enough space for trucks to make the turn. The required carve-out resembles the head of a loon, as shown here. Bowties are another creative innovation that add wonders to the form and can also improve the function beyond that of a normal Median-U. The Bowtie uses two roundabouts or ellipses, the centers of which can be used for stately shade trees, pedestrian refuge, or even transit stations. Where Loons and Median U's require a signal to stop oncoming traffic while vehicles U-turn, roundabouts and ellipses do not necessarily need to stop oncoming traffic with a mid-block signal. The mayor loves the monument he can fit into the Bowtie's ellipses, but just can't get support from the DOT nor residents for "Through-U-Rights." No problem! Just build the ellipses or roundabouts anyway, but still allow people to turn left at the main intersection as usual. The ellipses serve a useful traffic calming function. They define an "entry zone" into a more pedestrian-oriented place, and you have also gained a "Get out of jail free" card where if traffic ever gets bad enough, just put up signs showing the new way to go left, and voila! Significantly more capacity and reduced delay! 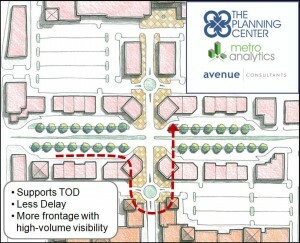 In Septemeber 2009, Metro Analytics developed the initial concept for this ThrU-Turn intersection in Draper, Utah. 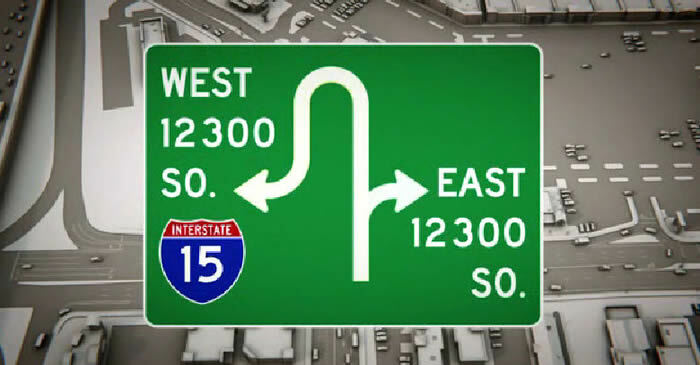 The City was excited about the posibilities, and together with UDOT sponsored a study to evaluate several options and ultimately determined to build a variation of that initial concept. For that study, Avenue Consultants conducted traffic engineering and simulation, and Metro Analytics provided future volume estimates. The project is scheduled to begin construction in 2011. Sign showing drivers the new way to make a left. 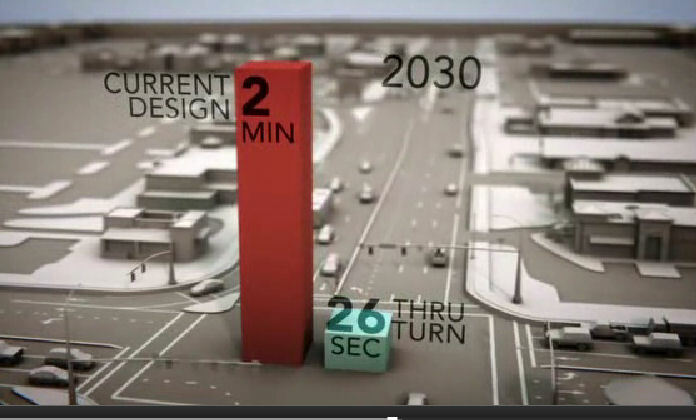 The 123rd South ThrU-Turn in Draper, Utah, is expected to reduce average 2030 delay from 2-minutes to just 26-seconds! The Thru-Turn family, along with several cousins such as Town Center Intersections, Continuous Flow Intersections, Quadrant Intersections, and others are among a series of concepts collectively known as Alternative Intersections, Alternative Intersections, or even Unconventional Intersections. The key trait that links all Alternative Intersections is that they successfully eliminate the "left-turn arrow" phase, which otherwise reduces intersection efficiency considerably. Thru-Turns and other Alternative Intersections can all be found at www.alternativeintersections.org, where you can search for every Alternative Intersection that exists or has been planned anywhere in the world. If you see we are missing some, register and add them! This site dedicated to ThrU-Turn designs, as well as www.alternativeintersections.org, are sponsored by www.metroanalytics.com.